Sunday June, 9th, half a dozen or so volunteers descended on Pescadero Avenue to take part in a joint project between San Diego Food Not Lawns and a local meetup.com group called SD Community Farms and Gardens. Their goal: to help local residents transform their water guzzling grass lawns with sustainable vegetable gardens. 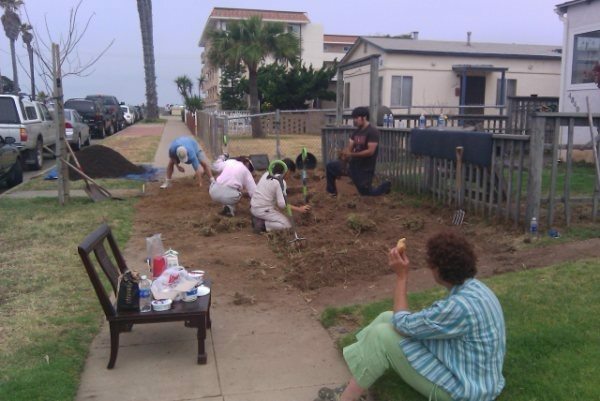 On this Sunday, the group was helping a couple local residents to dig up their lawns and plant an assortment of vegetables. The group provides a great way to get a head start as a homeowner who may be thinking of converting their lawn but lacks the resources or manual labor to begin the process. SD Community Farms and Gardens is a meetup.com group that organizes local San Diego residents with an interest in gardening and growing fresh fruits and vegetables. If you are not familiar with meetup.com, visit the website and take a look around. There are a variety of groups that meet around San Diego. You can find a variety of interests from Photography to Pilates, yodeling to Yoga, cooking to car-racing…you get the idea. Some activities are free, some charge, and many are donation based. Joann Lim, one of the founders and core-members of San Diego Food Not Lawns and the creator of the meetup.com group SD Community Farms and Gardens, said she was inspired to start the group to see more people growing food in the city, community lots, schools and home gardens. She believes there was a need for San Diegans to network with like-minded individuals to share ideas, labor, company and food. Meetup.com has presented itself as a perfect vehicle to connect with locals that share a passion for growing their own food. Where you aware that it takes approximately 42 inches of rain per year to keep an average lawn green and lush? San Diego gets an average of 10 inches per year. One of the many advantages of having a vegetable garden rather than a green lawn is that when your lawn is being watered, the goal is to spray a large amount of water over the entire surface of the lawn, whereas a in a vegetable garden, the water being used is directed at one particular area, and therefore uses less of one of our most precious resources. Green vegetation can also reflect as much as 25 percent of radiation from the sun, thus reducing warming in our cities. Finally, for those who don’t give a squat about the environment, a 600 square foot community garden can produce as much as $500 worth of produce each season. For a family of 6 on a food stamp budget, that represents a 40 percent increase in food resources. According to Joann Lim, there is no current funding for the SD Community Farms and Gardens meetup, and San Diego Food Not Lawns receives some donations from events like Earth Fair in Balboa Park. Otherwise, all of the labor is provided by volunteers, and Joann alone funds much of the meetup group activities. She does ask recipients of garden builds to refund the cost of some supplies or compost if they are able, and many of the people who have received new garden builds essentially pay-it-forward by volunteering their time and efforts for the next garden to be planted. 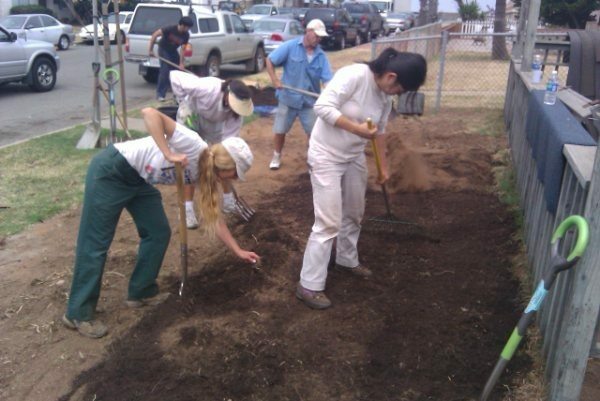 If you would like to get involved, or just learn more about San Diego Food Not Lawns, visit their website. To learn more and get involved with Joann and the SD Community Farms and Gardens meetup, contact her through the meetup.com site here . I wish I had a lawn to dig up and plant with veg, which is why I’ve been wanting to ask whether anyone else in the community is interested in starting a new community garden? The OB Community Garden is perpetually full and from the looks of it most of their plots look pretty permanent (chicken coops and even what looks like a small duck pond). So everytime I pass a vacant lot in OB, and there are several, I wonder if there is any interest out there? As I understand the process, it starts by finding out who owns the land and them asking them for permission to turn it into a community garden. Does the city own any vacant lots in OB? Hi Catherine, I would suggest contacting Joann Lim through that meetup.com page. She should be able to answer those questions better than I can. I just thought what they were doing was cool and am helping spread the word, but she’s the pro. Thanks for your interest. I will definitely be volunteering with them for any future projects in the OB/Point Loma area and will try to remember to post something on the Rag in advance if any new garden projects come up in our neck of the woods. Very interesting story. I will look for reports of new garden projects in the area. A colleague of mine works on a program in City Heights where neighbors volunteer to clean up dilapidated properties. Not so much gardening, but lots of pruning. Mostly elderly residents who are still living on their own but lack physical ability, money, etc to care for their property. Rather than just calling code enforcement on them, this group pools together and offers services. Kind of off topic but this reminded me of that for some reason. Cool article – glad to hear Food Not Lawns is making headway in San Diego, and in OB, in particular. There’s a similar program in Portland, Oregon, where you can sign your front lawn over to this group who does all the gardening (you just provide the water) and then they periodically bring you a big basket of goodies grown on lawns around your neighborhood. All about keepin’ it local! Given the desert we live in – it’s amazing that (other than in actual active recreation areas) – lawns are allowed at all? Older Article: The Bomb Drops on Ocean Beach. Newer Article: Will Ocean Beach come together and do something about our homeless?